HELL YEAH ! 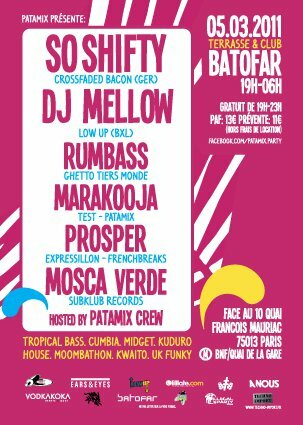 Tropical Madness are proud to present their second party @ Le BATOFAR in Paris, France. For the second edition PATAMIX CREW invites SO SHIFTY revelation of the famous US label Crossfaded Bacon and praised as ‘The Best New Thing’ by DISCOBELLE. DJ MELLOW member of The Peas Project band and organizer of the LOW UP parties that cannot be ignored in Brussels. Prosper, Marakooja, Rumbass, Mosca Verde and of course PATAMIX entire crew: Sphere, Trimaps, Xployaz, 2Mo, Fdp, Dk and Bio.